Figure 4.21: Plot origin can be translated freely with -X -Y. 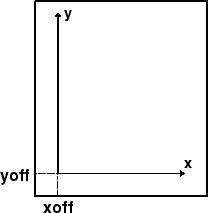 -X and -Y shift origin of plot by (xoff,yoff) inches (Default is (X_ORIGIN, Y_ORIGIN) for new plots4.9 and (0,0) for overlays (-O)). By default, all translations are relative to the previous origin (see Figure 4.21). Supply offset as c to center the plot in that direction relative to the page margin. Absolute translations (i.e., relative to a fixed point (0,0) at the lower left corner of the paper) can be achieve by prepending ``a'' to the offsets. Subsequent overlays will be co-registered with the previous plot unless the origin is shifted using these options. The offsets are measured in the current coordinates system (which can be rotated using the initial -P option; subsequent -P options for overlays are ignored).